It happens to us all: we glimpse at our faces in the mirror or in a photograph and realize that we've aged. Our formerly fine lines have begun to etch deeper grooves, our discoloration has become more pronounced and our once-taut jaw lines have become slack. Skin aging is a gradual process affected by external factors like smoking and spending too much time in the sun, as well as internal factors like genetics. These factors contribute to ROSs, MMPs and AGEs – the three biochemical reactions that manifest wrinkles, discoloration, loss of skin tone and other signs we typically associate with aged skin. Amazingly, these signs start to appear as early as our 20s(! 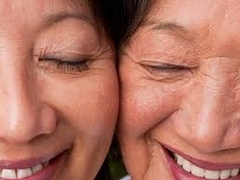 ), when production of collagen (which keeps skin firm) and elastin (which keeps skin bouncing back), begins to falter. Cell renewal gradually slows, and skin begins to lose its youthful glow and texture. Is this all too depressing? It shouldn't be! The good news is, while there is no cure for aging, there are many steps we can take to control the factors that contribute to skin aging. It all starts with choices. Research also shows that choosing to eat more fruits and vegetables helps prevent inflammation that can lead to skin aging, while choosing to eat a diet high in sugar or other refined carbohydrates can accelerate the skin aging process. Smoking is another major no-no when it comes to aging. Cigarette smoke basically assaults your skin with free radicals, robbing it of the oxygen it needs and leaving rough texture, fine lines and wrinkles behind. Choosing to quit can help improve circulation and eventually bring back that healthy glow. Finally, choosing to commit to a regular skin care routine is tantamount to reducing the appearance of skin aging. Regularly and thoroughly cleansing, exfoliating and hydrating skin is a great start, but paying attention to the ingredients you use is even better. With science on our side, we're able to leverage active skin care ingredients that have been shown to impact the biochemical reactions that lead to skin aging. Dermalogica's AGE Smart® system has been formulated to do just that with unique combinations of the industry's top age-fighting peptides, retinoids and antioxidant vitamins. Look for ingredients like microencapsulated Retinol, Palmitoyl Tripeptide-5 and Magnesium Ascorbyl Phosphate (Vitamin C) to help jump-start your skin care routine, and talk to a Dermalogica skin therapist about how to restore healthy, glowing skin.